It is on the banks of Botswana’s fabled Stolen River, that you will find Savute Safari Lodge in a setting of remarkable beauty. 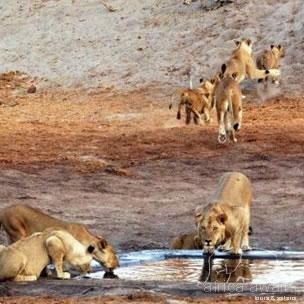 The now dry Savute channel is part of the dynamic Savute eco system renowned for its large concentration of elephant and lion and their troubled relationship. It is on the banks of the dry Savuti channel that Savute Safari Lodge peers out from amongst the beauty of gnarled acacia camel thorn trees. This channel has a bizarre history of drying up during good rains and having flood levels at other times. 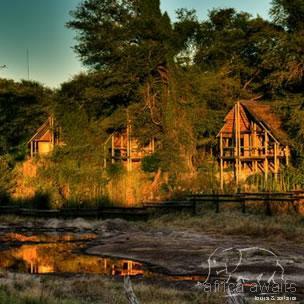 The beauty of this area, created by the silhouettes of the many dead trees which relied on sustenance from the water supply of past years, combined with the congregations of old bull Elephants, diversity of animals and abundance of predators makes Savute Safari Lodge a highlight destination for any safari traveller to Botswana. Geographically, Savuti is a place of mystery and great unkowns. The fascination which adds to this true African wilderness area – The Savuti Marsh, is a remnant of a vast inland lake, cut off from its traditional supply of water many years ago by the same movement of the earth`s tectonic plates that brought the Okavango Delta into existence. It is part of the Mababe Depression and is fed by the temperamental Savuti Channel, which has not seen flowing water since it dried up in 1982. Savute’s signature expansive glass sliding doors and viewing decks were inspired by the striking panorama, whether seen in the dry season when it can appear desert-like and barren beyond belief or after the rain on one of those crystal clear days across the vivid green of new grass, the impression is always the same. Savute Safari Lodge accommodates only 24 guests in local timber and glass suites with cool thatching, beautifully furnished in fresh colors. 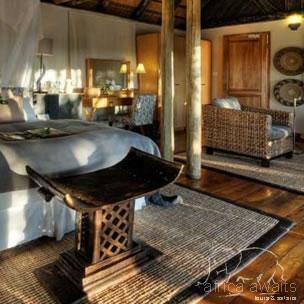 All chalets have private decks, a combined bedroom / lounge area and en-suite facilities, which sets the lodge apart from typical safari accommodation. The lounge, library and cocktail bar are situated in the exquisite thatch and timber main building. Overlooking the channel, Savute boasts a viewing deck, al fresco dining area & swimming pool - ideal for watching game at the water hole. The viewing deck is utilized for brunch and dinner, however is dependant on weather and animal activity at night. After dinner, enjoy a night-cap by the fire-side whilst viewing the bull elephants congregate at the water-hole for their night-cap. Game drives in open 4x4 safari vehicles are conducted in the Savute area, including the Savute Marsh, and a visit to the ancient San rock paintings at Gubatsa Hills. You will most likely see nearly all the major species in the area, such as giraffe, elephant, zebra, impala, tsessebe, roan, sable, wildebeest, kudu, buffalo, waterbuck, warthog, eland, as well as predators including lion, hyena, jackal, cheetah and possibly wild dog. The second biggest summer zebra migration in Africa can be seen at Savute. This starts around November / December when the rains fall through to March / April when they end. With your holiday, safari or business trip from in to Savute Safari Lodge in Botswana.